On Friday, May 19, Intacct rolled out Release 2 of 2017 with a host of new features, including the first chance for most customers to try out the new Intacct Action user interface. I know we’re all super excited to work in those clean white screens, but I can’t let the thrill of a shiny new UI completely overwhelm news of some updates in Projects! Users of Projects (including your author) have been seeing a steady stream of functionality with each quarterly release of Intacct upgrades. This time around, one of the time-consuming pieces of managing projects just got easier: resource scheduling. A year ago, Intacct introduced Resource Scheduling and Gantt charts as a way to manage and view project resource assignments and task progress. While getting that information out in the form of a chart is great, it has required a lot of input and maintenance to get good numbers. Each release since then, Intacct has added shortcuts to make that maintenance less of a chore for the project administrator. First, now you can schedule a resource to a task on a recurring basis. So, if somebody needs to spend four hours a week on Planning, you can assign them to the Planning task and have it repeat that four-hour assignment every week until a specified end point (or leave the end point blank and let it go indefinitely). 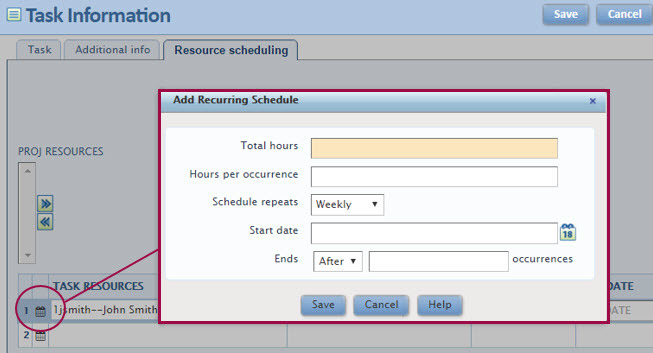 All you do is go to the Resource Scheduling tab on the Task, click on the calendar icon, and fill in the Add Recurring Schedule popup. Second, the inevitable shift in task or project timelines isn’t the nightmare it once was. Now you can change the start date of a single Task in a Project, and you have the option to shift all the resource assignments right along with it and to optionally shift the task end date as well. This not only works on the Task, but if your entire Project timeline shifts, you can move all the Tasks and Resource Assignments automatically. So freakin’ cool! Finally for this go-round, now when you create a new Task, it inherits the start and end dates of the Project, making it faster to set up and manage a single-phase project where all the Tasks have the same parameters. If that doesn’t work for you, you have the option of turning it off in the Configure Projects page. Okay, now let’s talk about Action! To switch on Intacct Action, go to the upper right of your Intacct screen and click Enable Beta UI. This is an individual option, so it won’t affect other users and your underlying data will not be affected. And you can turn it on and off as you wish. Turn on Intacct Action and watch your Intacct experience jump in to the future! Of course this is what they call a public beta so you might find some oddities. Just use the easy feedback button to let Intacct know! The full release of Action is planned for Release 4 of this year. These are just a couple of the new features in the latest release. We’ll touch on more in the weeks ahead! To see more about how Intacct helps manage Projects for businesses and nonprofits, register for our webinar on The Smarter Way to Manage Project Billing, June 2, 2017 at 11:00 AM PT. Or you can find out more about Intacct Projects here.